Back in my Houston days, a couple of my friends and I used to have a sort of a supper club. We would pick a country or a region, research it’s cuisine and then cook about two or three dishes from there. We would gather at one of the homes and since our children were friends also, we would have a great get together every month. They were so much fun and especially, for me who loves to research stuff. We had them regularly until Tracie moved away to Ohio and then I moved to Colorado. I am thinking of starting another one here but need to find the right people; ones who like to cook and like to cook varied cuisine, and who don’t mind doing a bit of research before heading into the kitchen. If I do get one going, then there will be plenty of posts on those! So, what does this all have to do with paella? Well, one of our monthly supper clubs was based on food of Spain and France. I had made a paella. At that time, I didn’t own a paellera but made do with a big round pan and the paella was a success. Everyone loved it, except me. At that time, I had placed the shrimp on top of the rice as it was finishing up. Everything was cooked perfect and I remember transporting the paella to my friend’s house, all the while tying not to gag from the smell of the shrimp emanating from the back. Oh, it was bad. If you have been reading my blog for awhile, you will know I am picky about seafood and very sensitive to smelly seafood. I could barely take a bite of my paella that I had worked so hard on. 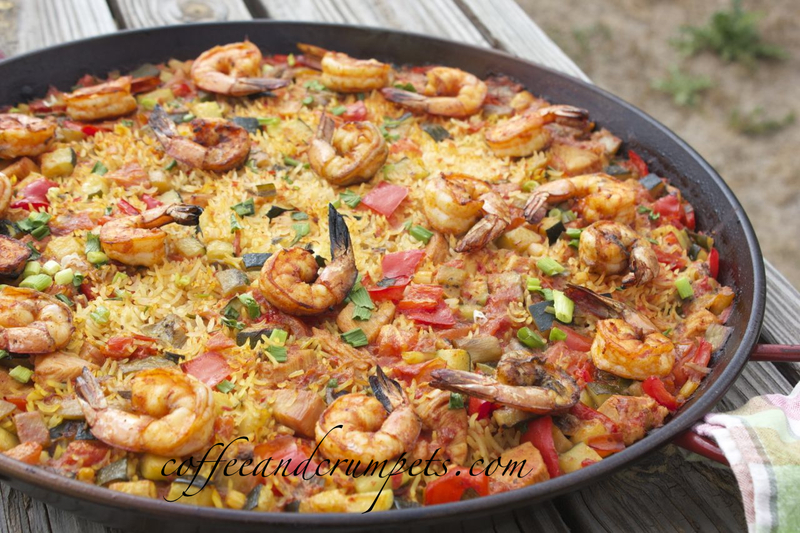 The shrimpy-ness was vibrant throughout the entire paella. Needless to say, my paella making days came to an end. I just couldn’t make one with or without shrimp, without being overwhelmed with nausea! I have terrible issues with associations of any kind; music, smells, taste..it’s a killer. ANYWAY, when I found out that the Daring Cooks challenge was a paella, I didn’t panic. In fact, I was excited once again because a while back, I had purchased a paellera from Williams and Sonoma for when the time eventually came for me to overcome my paella fears. Seemed like a good time to get over it. Our Daring Cooks’ September 2012 hostess was Inma of La Galletika. Inma brought us a taste of Spain and challenged us to make our very own delicious paella, or in my case, get over the fear of making it again! I did some more research and found out the origin of the paella is from Valencia. The Valencian paella consists of only a few ingredients including snails and rabbit. I didn’t particularly feel a great need to go out to my garden and dig up snails or hunt the little bunny who likes to hang out back there. I decided that I didn’t have to be too authentic to Valencia and to just go the route of the general Spanish paella. Spanish paella can be anything, as I found out; vegetarian, seafood, meat or mixed. I always thought that paella was made from short grain rice, like arborio or the Spanish bomba, but it seems that many Spaniards have made life easier for themselves and started using long grain rice or even par boiled rice, like Uncle Ben’s. If it’s good enough for the Spaniards then it’s good enough for me! I chose a long grain Indian par boiled rice called sela. I found the paella to be very improvisational if you choose not to make a true Valencian. Since I have a “vegetarian” (I use that term lightly), I chose to add a lot of vegetables in my paella and then a bit of meat for the carnivores. I even added shrimp, but cooked them separately (a very good idea.) My vegetable selection ended up being whatever was in my fridge that day: eggplant/aubergines, zucchini/courgettes, fresh tomatoes, and red bell peppers. There seems to be a big dispute on the addition of onions; some say they add them and some say “NO!” I didn’t want to offend anyone, so I added green onions near the end. Since my paellera is a decent size, I cooked my paella on the grill outside. This time I used the gas grill so I could have control with the burners and temperature control. Next time, I will use my charcoal one to get some extra smoky flavour. I loved cooking outside on the grill. The weather was sunny and beautiful and the sizzling sounds of the paellera made it all the more enjoyable. The smoky aroma of charred meat and vegetables wafting from our garden, I am sure, distracted the young football league practising in the fields behind our house (because the next practice they brought a bbq and were grilling hotdogs) The fact that the house stayed nice and cool and smell free, was another nice addition. It’s not necessary to use a grill or have a paellera, but it does add a bit of authenticity and makes you look super savvy :). I am one of those people who loves to own every pan….just incase. I just think that it is much more fun to cook when you have the right equipment. It is hard to stay enthusiastic about cooking because, let’s face it, it can quickly become such a chore. I love cooking and baking but there are days I just don’t want to…and this is where the pans and nifty gadgets come in. Still, use a skillet or fry pan to make this if you don’t own a paellera and don’t want to own one. It’s a great dish to make for company, it will definitely impress your guests and it’s a great dish for the weeknight too. 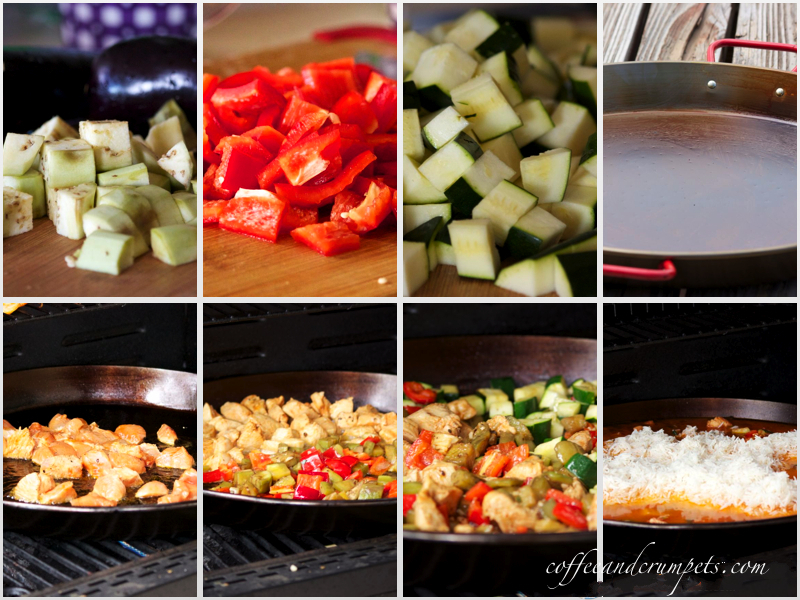 You can make it with whatever you have on hand and it’s a wonderful one pan meal. 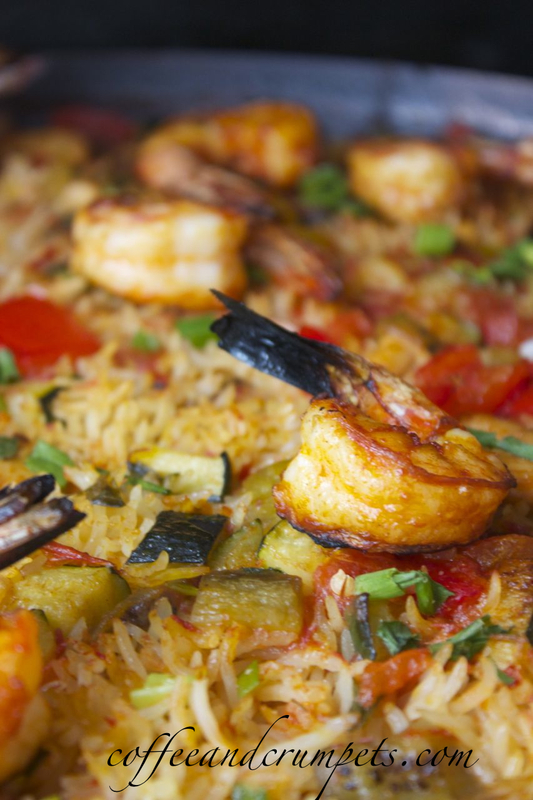 An authentic paella does add saffron for colour and some floral flavour. Tomato sauce and paprika are traditional additions too. My paella was quite big and it can easily be halved. My big paellera fed about 12-16 people. In a pan on the stove top or in a paellera, heat the olive oil till hot. Add the chicken pieces and toss around till brown. If cooking in a paellera, you can push the meat aside and let it cook and add the eggplant to the other side. In a small pan, you may have to cook chicken first and remove. Once the eggplant is browned and soft, add the red bell peppers and let them get some colour. Add the zucchini last and let them cook till brown and soft. In my paellera I kept adding the vegetables to the pan while pushing the cooked vegetables to the side. Add the tomatoes and the tomato sauce and let them cook. The tomato sauce will start making a sauce in the pan with the olive oil. Add the smoked paprika and check for salt and pepper. Once the broth is bubbling, add all the rice and stir gently to distribute. Add the green onions and the saffron threads. Once the rice is spread out evenly, leave it alone. Let the paella cook and the rice absorb the broth. You can gently shake the pan or rotate but don’t stir. to absorb the liquid and steam a bit. After the liquid has evaporated, you can cover the pan and let the rice steam a little. If you are outside on the grill, easiest thing is to grill the shrimp. If you don’t have enough grill space, then cook shrimp before starting the paella and keep aside. 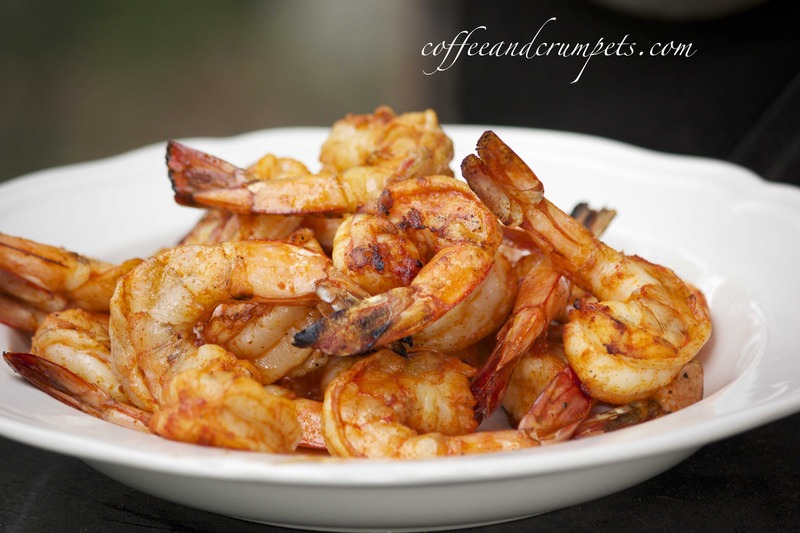 If you are cooking inside, cook the shrimp outside on the grill or broil them until pink and crispy. You can also sauté them if you wish with a bit of olive oil. Before serving, place the shrimp on top. This time round, the paella was great and the shrimp were excellent. Since I had grilled them separately, they had such a nice smoky, charred flavour that didn’t permeate the whole paella. The sela rice worked like a charm; the rice cooked quickly and had such beautiful long grains. I did get a little bit of the prized crust at the bottom of the pan that everyone wants. I have to admit that I didn’t let it cook long enough to get a thicker, crustier layer at the bottom. All in all, it was a great challenge and I am glad that I finally made another paella. Is there anything you have made with enthusiasm but didn’t turn out well? Did you try again or decided that it wasn’t meant to be? Hope you have a great weekend that is filled with pleasant kitchen experiences! Wow! That is a wonderful Paella!!! I love Paella and enjoy it too much. It’s hard for me to stop eating because it has all my favorite things – seafood, rice, and lots of veggies… Yours look spectacular! I hear about supper club and I wish I knew about it when I was younger (which means kids-less)… Maybe when they get a little older I want something like that to enjoy cooking with others and challenging different food! I wish you lived closer, it would be fun to be in a supper club with you!! My husband is very picky about seafood too. I think so that because he grew up with daily fresh fish, while fresh fish is a rarity if not impossible in middle europe where I grew up. 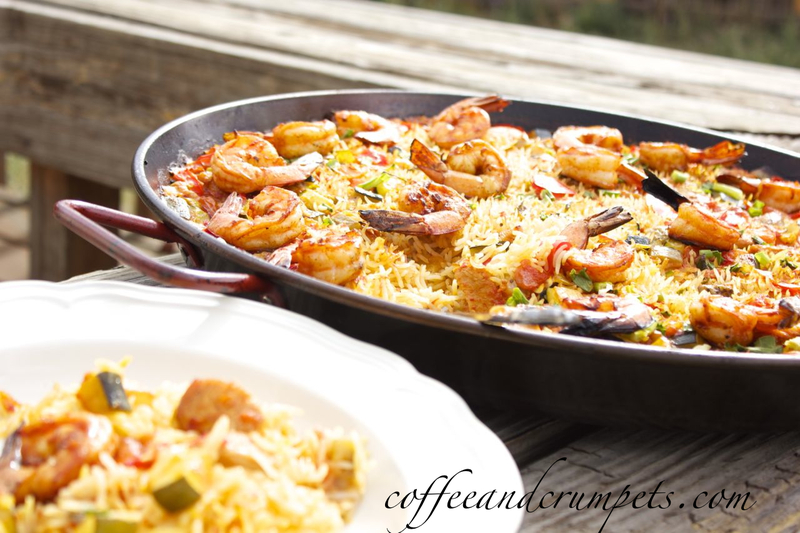 I have never tried paella but the whole world has been telling me stories of its beauty. =) Your are really daring Nazneen! I am not sure if I d try it out yet. Maybe if you would make me some. thanks for the useful tips! It’s true, of you don’t grow up eating seafood, I think it’s hard to overcome the smells and tastes. I only ever ate cod growing up, in England that’s the popular fish and that’s what my parents bought. They love seafood though, I’m didn’t get that passed down to me! 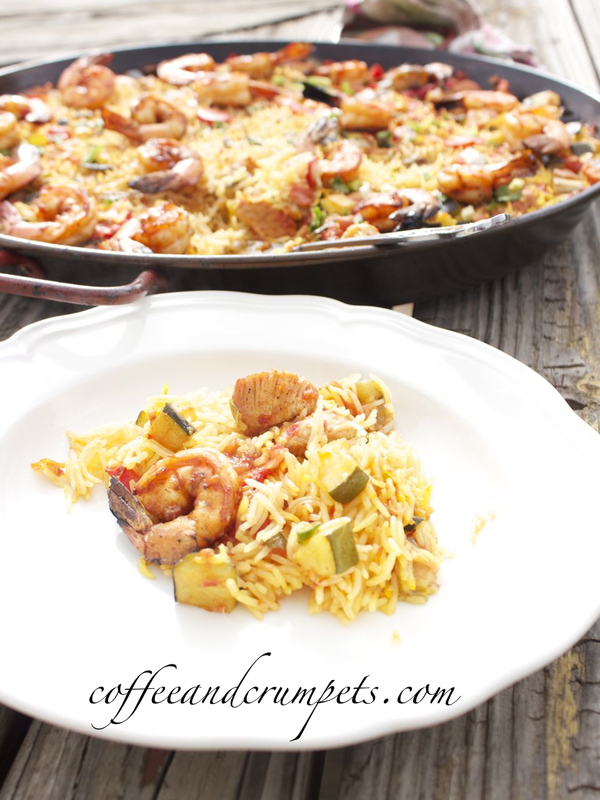 Paella is easy and you should have no trouble making it if you choose to! Thanks GG! I am glad I am not the only one with seafood issues! I heard you can develop allergies all your life and I know I have some allergy because I break out all of a sudden. I am trying to find the right people still for my club. Hopefully soon! Thanks Uru! It was pretty good. You can make a great vegetarian version by leaving out the meat. You’re welcome Meli! Let me know how it turns out. I hope you are well and the kids too. I miss you guys!